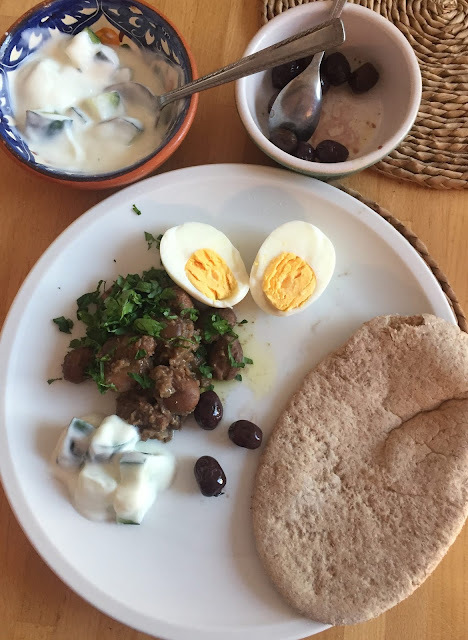 Ful medames (Mudammas) is a spiced fava bean “stew” often eaten throughout the Middle East and North Africa. There is evidence of ful in Egypt dating back to the 4th century and I have read that the beans were buried in large pots in the ground – mudammas means "buried", hence the name. Besides being inexpensive and easy to prepare (although a lengthy process if using dried beans) it is a very nutritious and filling dish often eaten for breakfast. It is slow to digest because of its high fibre content, so it releases a steady stream of energy for several hours after consumption, keeping hunger at bay for longer. For this reason it is a popular dish during Ramadan for suhoor,(sohour) the meal served before sunrise and morning prayers. Ful is packed with goodness - lots of protein, antioxidants, vitamins B1, B6 , B9 (folate/folic acid) and minerals,iron, copper, manganese, calcium, magnesium and is one of the highest plant sources of potassium. The absolute essential is dried fava beans, but some recipes may also add lentils (which help to thicken the sauce) or even chickpeas. We have several Middle Eastern shops nearby but if you don’t have one or cannot find dried fava beans in your grocery shop or supermarket you will probably find them in a Turkish shop where they may be called Bakla. The cooking time will vary depending on the quality and age of the beans but usually they will need 2 – 3 hours. If you cook more than you need, they will keep for up to a week in the fridge. Pour the excess cooked beans into a container with an airtight lid and let it cool. When cold pour the juice of one lemon on to the surface. Put on the lid and store in the refrigerator until needed. The essential ingredients are dried beans, olive oil, lemon juice and garlic but almost all versions also have cumin. Here is my basic recipe which will be more than enough for 4 - 6 people or will keep in the fridge for several days. Rinse the dried beans under running cold water, place in a large bowl and cover with fresh water. Make sure there are two to three inches of water above the beans as they will absorb a lot - and leave to soak for several hours or overnight adding more water if necessary. Rinse the cooked beans with cold water and drain. Place the beans in unsalted water in a large saucepan and bring to the boil, then simmer with the lid on until tender, about 2 ½ to 3 hours - adding more water if necessary to keep them covered during cooking. When the beans are tender, remove the lid and continue simmering to reduce the liquid or pour off any excess liquid – there should be enough to coat them but they should not be swimming. Remove two tablespoons of cooked beans, mash them and return to the pan and stir. This will thicken the sauce. Remove from the heat; add half the oil, half the lemon juice, the cumin, garlic and a teaspoon of salt. Adjust seasoning to taste adding more oil, lemon juice or salt as required. It can then be served warm, possibly topped with chopped tomatoes and parsley. It is generally acknowledged that the original ful was an Egyptian dish but there are now many national and regional variations and some would claim it as their national dish. You could add finely chopped onions that have been cooked gently in olive oil until soft (with or without the addition of chopped tomatoes or tomato paste) which can be stirred into the beans with the cumin. Some recipes add crushed coriander seeds as well as cumin. You can make spicy tomato ful by adding 1 tablespoon of tomato paste or passata and 1 teaspoon of harissa paste or half teaspoon of chilli powder, cayenne, or chilli flakes. Another possibility is Tahini Ful. Add 1 tablespoon of tahini paste mixed with 1 tablespoon of lemon juice. There is also a variety in Egypt of Butter Ful where 1 -2 tablespoons of butter are stirred in to the final mix. Usually it is served with warmed flatbread and often with hard boiled eggs, halved or quartered on top or with olives and tomato salad, or cucumber and yoghourt or for a more authentic Middle East dish, labneh. As you can see it is a very versatile dish so you can experiment with your favourite herbs and spices and create your own signature dish.